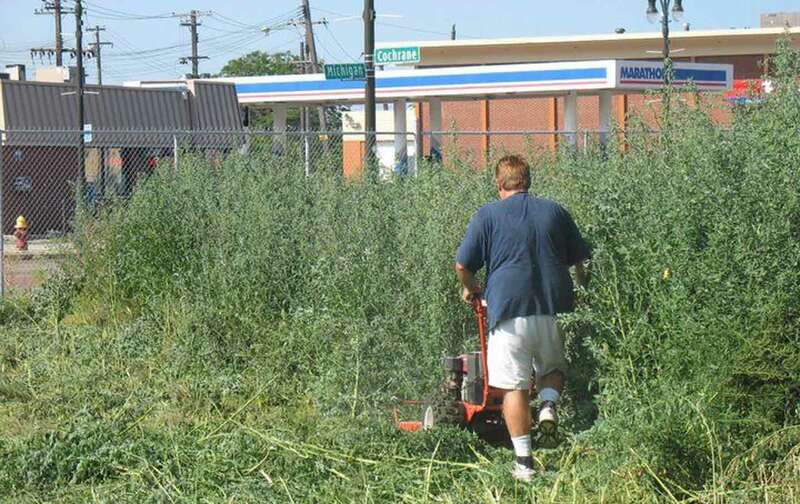 In May 2010, nearly a year after the last grandstands of Detroit’s Tiger Stadium were finally torn down, Tom Derry hauled his riding mower to the corner of Michigan and Trumbull to begin attacking weeds six feet high on the abandoned field. Derry, a mail carrier, was suited for the task in body and spirit. Each year he hosts a raucous Babe Ruth birthday party at a nearby watering hole. Large and gregarious, with a fierce passion for baseball, Derry is a gentle giant in the Bambino mold. This article is part of the Edge of Sports series, an ongoing effort to publish writers on the intersection of sports and politics. Cops at first threatened to arrest Derry for trespassing, but he kept coming back. Eventually they just ignored his efforts, and soon he attracted helpers who named themselves the Navin Field Grounds Crew, evoking the stadium’s original name, dating to 1912. Once the field was cleared of weeds and debris, visitors began to stop by, walk the historic base paths, and play catch on the unauthorized diamond playground. Pickup games, with players of all ages, sprung up; groups came for birthday parties and other events. People even began to spread their loved ones’ ashes on the field—Derry has witnessed at least two dozen memorial services. In August 2014, Derry himself got married there. Fans were glad to return to the site of Tiger Stadium. After the 1999 season, when the Tigers left what is widely known as “the Corner,” many wept. Team owner Mike Ilitch worked the same scam as sports teams in other cities, claiming that public money for a new stadium would spin off economic growth (a claim that turned out to be mostly untrue). The Tigers got their public money to build Comerica Park, and the hulk of the beloved old Tiger Stadium went through a cycle typical of thousands of fabulous Detroit edifices: It sat vacant for years then stood partially demolished for many more. Trees grew through the grandstands. The city didn’t have the resources or the will to tear it down completely until 2009, and it ignored all proposals to reuse the site in any appropriate way. So Tom Derry and other fans took matters into their own hands and have maintained the grounds for the last six summers with their own sweat and limited resources. 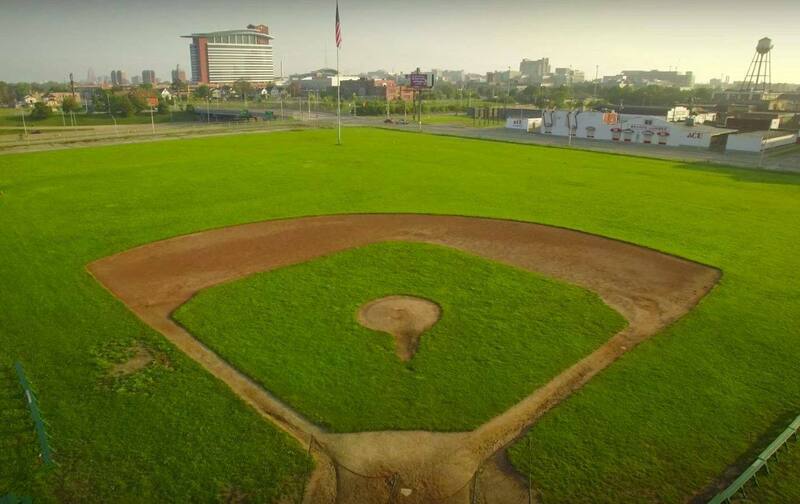 However, last November the Detroit City Council green-lighted a controversial plan that will end the public’s free access to the historic diamond and finally build on the vacant property. This spring, groundbreaking is set to begin for a small stadium and banquet hall. The stadium will be a showcase athletic facility and training center for city youths and include a new headquarters for the Detroit Police Athletic League, which has long run sports programs for kids on fields throughout the city, many of them poorly maintained. Some fans, including Derry and his Navin Field Grounds Crew, oppose the project, and not just because they’ll lose access to the field. PAL plans to cover the historic 9-acre green space with a potentially dangerous artificial turf field. For the first time since 1999, people with power are paying attention to the Corner, but no one is listening to the people who brought it back to life. Much of Detroit is like a cemetery with unmarked graves. Lately the city has experienced a belated, spotty, and much-ballyhooed gentrification. But it’s still down over a million residents since 1950, when it had the nation’s most single-family homes, many of them magnificent. Few are still intact, and burned-out or crippled remains sit scattered on mile after mile of devastated, mostly empty blocks where middle-class families once lived the American dream. History is a messy and contentious thing. And, in Detroit, it’s too often a battleground. But it’s unwise and unfair to cover up the complex past of Michigan and Trumbull. In the 19th century, the Corner was a wooded grove and then a hay market, and in 1896 it became Bennett Park, where the Tigers first played pro ball. Arguably, it is one of the oldest sites for baseball anywhere. Throughout its history the field has hosted all kinds of events: Joe Louis defended his heavyweight championship in an outdoor ring there in 1939, and in the dark days of the Depression and World War II, slugger Hank Greenberg’s heroics gave the nation’s Jewish community something to cheer about. Robinson played there in the 1951 All-Star Game, and the Detroit Lions played football there from 1938 to 1974. In the magical summer of 1976, Mark “the Bird” Fidrych captivated the nation by talking to the ball and grooming the mound. Kirk Gibson took Goose Gossage deep in the 1984 World Series. Eugene McCarthy spoke at a 1968 rally and Nelson Mandela did the same in 1990. Nostalgia for the Corner persists throughout the great Detroit diaspora, with personal memories of precious moments there inextricably tied to the enduring soul and unbreakable spirit of a beleaguered city. The Police Athletic League came to Michigan and Trumbull with the blessing of the Old Tiger Stadium Conservancy, a small group of baseball preservationists who for more than a decade tried to support the best proposals for reuse of the site, such as a smaller stadium for college sports and minor-league ball, and help block the worst ones, like a Walmart and a warehouse. The conservancy controlled $3 million left from a federal earmark Senator Carl Levin procured in 2009 for redevelopment and preservation in Corktown, the old neighborhood around the stadium. Corktown is now an address of choice for transplanted Brooklyn hipsters, and needs no further economic boost, so Conservancy leaders have voted to give the earmark to PAL under a tortured definition of “preservation.” Though the conservancy doesn’t like the proposed artificial playing surface, they fear a worse fate for the Corner if the plan falls apart. Sites of former baseball stadiums in other cities are mostly plowed under, built over, or forgotten. League Park in Cleveland has been preserved, but its small history museum is open only on Saturdays. A more successful model of reuse is Heritage Field, the site of old Yankee Stadium, which has retained the historic diamond and added two other fields for youth baseball and softball. Something like that would work well in Detroit. No one argues with young people playing ball at the Corner, but scientists, athletes, and parents have raised concerns about the risks associated with artificial turf. Studies have shown that falls on artificial surfaces mean more severe injuries, and on hot days surface temperatures can rise as high as 160 degrees. Even more concerning, however, is the number of athletes who played on artificial turf and were later diagnosed with cancer. Last year, an extensive ESPN report examined the link between synthetic turf and cancer. While the turf industry says its products are safe to play on given “the available data,” ESPN pointed out that there aren’t yet data on the risks associated with ingesting turf, through inhalation or abrasions, or the long-term effects of playing on the stuff. “As state and federal agencies grapple over the potential for risk associated with these fields, parents…are still left wondering about the safety of these fields.” It’s a controversy that’s being played out in communities all over the country. Given these potential hazards, the plan to destroy the existing grass at the Corner and have children play on turf is nonsensical. But PAL CEO Tim Richey insists the carpet is necessary to support the intensive programming PAL plans—soccer, football, and even lacrosse, as well as baseball. The organization has batted down vociferous objections raised at public meetings in recent months. When PAL sought the advice of Michigan State University turf expert John Rogers, the professor told them its maintenance budget was short for real grass—and so he reluctantly recommended a carpet. Richey then touted his response as an unqualified endorsement, when in fact Rogers opposes artificial turf. But a synthetic field will cost PAL about $1 million to install and likely need to be replaced every ten years. Over the same period, PAL would pay no more than that to install and maintain a grass field. Since Richey has insisted that the safety of young athletes is PAL’s top priority, his stubborn embrace of artificial turf is bizarre. When pressed, Richey insists a natural field would not hold up under the heavy use PAL plans. He expresses more concern about playing an occasional football or soccer game on a muddy field than about any long-term problems with artificial turf. Already one major corporate supporter, the Lear Corporation, has pulled its backing of PAL completely because it opposes the carpet. And PAL still has millions to raise for the project. Even so, on February 2—at a pep rally–type press event where none of the presenters or supporters even mentioned the project would feature artificial turf—PAL announced it intends to start construction in April. Everyone wants PAL to succeed in its mission of serving city youth, but does that have to come with these risks, and at the cost of this historic and beloved site? PAL’s plans for commemoration are vague and perfunctory, consisting mainly of memorabilia displays and videos of various athletes. The history of Michigan and Trumbull deserves to be better told. Michael BetzoldMichael Betzold is a former Detroit Free Press reporter and the author of Queen of Diamonds, a definitive history of Tiger Stadium.